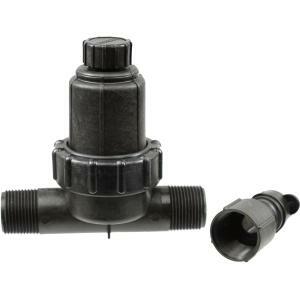 HRZ 100 2-in-1 MPT (male pipe thread) drip filter and pressure regulator combo stands in the market as one of the industry’s best “one piece” low flow irrigation filter and regulator combinations, compact enough to fit in a 6" round valve box! On the outside, the 2-in-1 threaded models move away from their competitions traditional plastic construction, to a design of strength and durability featuring commercial grade glass-filled nylon. Inside, the 2-in-1 threaded models can handle water flow as low as 0.1 GPM and pressure up to 80 PSI. The 2-in-1 threaded models offer 30 PSI pressure regulation, a 200 mesh filter, and are “drip-ready” with an optional .700" tubing adapter for a quick and easy connection to 1/2" (.700" OD) drip tubing. Always install pressure regulators downstream from all shut-off valves. Be sure to install pressure regulators in the proper direction. The arrow on the housing shows the direction of the flow and should always point downstream toward emitters.